Flair Air (formerly New Leaf) is showing flights where you fly from Hamilton to Kelowna, and then Kelowna to Toronto - for a total of $211 CAD roundtrip including taxes. 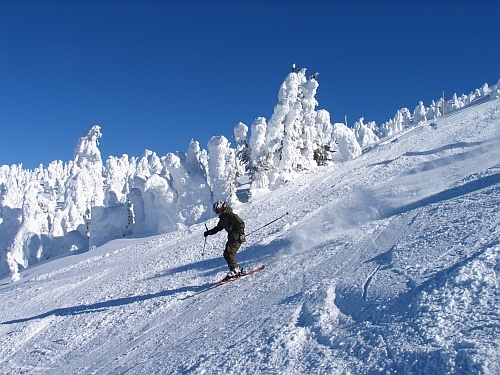 Big White is a popular ski hill in Kelowna. 3. A box should come up that says 'We have found cheaper flights at nearby airports' for $205. Click on 'Show All Offers' within this box. You should now see flights from Hamilton (YHM) to Kelowna, and then Kelowna to Toronto (YYZ) for $205 roundtrip. 4. Click on 'See details' to see which booking sites are showing this price. I have had the best luck with clicking through to Flighthub or Gate1. BudgetAir doesn't always work. toronto, yyz, flight deals, british columbia, canada, bc, north america, hamilton, yhm, kelowna, ylw and flair airlines.